Since I have some Silverlight 2 projects in development and Silverlight 3 is up and running I decided to upgrade some of the projects to Silverlight 3. While doing this I decided to use some of the new features that Silverlight 3 has. One of this is the MouseDragElementBehavior which is making my work a lot more easy if I what to make a draggble control. Since I’ve searched the internet for a simple and clear example with now many results I’ve decided to make a simple example to demonstrate and understand how this works. How to make a element or control draggble? 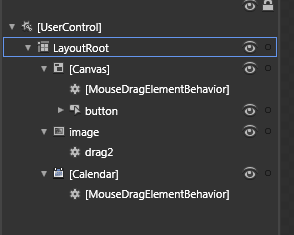 You just drag the MouseDragElementBehavior from the Assets panel from the Behaviors category to the element you what to drag. Now while experimenting this the first control that pop in to my mind was the Button. After adding the button to the LayouRoot and adding the behavior I was expecting it to work but it didn’t, so I’ve made a little work around this. The button could not be draggble because the button is catching the mouse event while you click on it. So one simple way to avoid this is to insert the Button in a container like a Canvas and make the container draggble. In this case you just add a Canvas add the Button or if you already have the button use the Group Into function. To be able to select the container with the mouse you must leave a space between the button and the container margin, like I did (see the grey area). Adding the behavior to the control. This entry was posted on July 25, 2009, 5:54 pm and is filed under Computers and Internet. You can follow any responses to this entry through RSS 2.0. You can leave a response, or trackback from your own site.